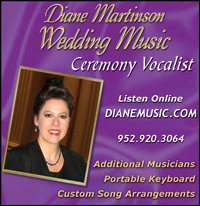 MN Wedding Singer, pianist, string trio, harp. Outdoor Portable keyboard and sound PA. Experienced ceremony professionals recommended by area wedding planners.